Planning a getaway with your sweetheart to Miami Beach? You could not have chosen a more romantic location for your weekend or week-long tryst. There are so many choices for accommodations, dining, and entertainment in Miami that you want to be sure to choose the ones that keep the spark going between you. Romantic accommodations in the area include plush hotels with luxurious guest rooms and multi-room suites, comfortable and quiet bed and breakfast establishments, fully equipped beach houses, and ocean-front condos. The most romantic vacation rentals provide room service or champagne delivered to the room. Some inns do not offer room service all day but do provide breakfast in bed and may have champagne and/or dessert or other specialties delivered at your request. Some will pack a picnic basket for you to take on a quiet outing for two. Premium service facilities often provide a cozy robe that will be hanging for you in the bath. In-room Jacuzzis and warmed towel bars are available in some accommodations. Premium high thread count sheets and soft comforters will grace the queen or king size bed. Take a look around at our website or ask one of our friendly agents to assist you in choosing the best rental for your needs. A fine establishment should either provide or be able to recommend indulgent spa services with a variety of services including a couple’s massage for those wishing to seek a little pampering. After your room accommodations are all set, special outings for your loved one comes to mind. Dining in the dark by moonlight or on the waterfront by candlelight will make for an exciting evening and memories to cherish. Where can you have a romantic dinner overlooking the water? Think about visiting Nikki Beach or Smith and Wolenski Restaurant. Or take a lovely walk in an area with quaint shops and large canopying trees? A walk down the street of Espanola Way is a must. This short street is reminiscent of another time and place, far away. The top places you must see with your significant other include the impressive Versace mansion, Casa Casuarina, and for animal lovers, the Miami Zoo or Miami Seaquarium, one of the nation’s best aquariums featuring dolphin shows and interactive dive experiences. A beautiful place to take a stroll, arm in arm, and perhaps have a picnic would be the Vizcaya Museum and Gardens, known for its incredible botanicals. Romantic day excursions for the adventurous types include scuba-diving, diving with dolphins through local services, or renting a boat and sailing. Perhaps you are interested in a little less adventure. Miami is known for its numerous bike exchanges throughout the city. Take a bike ride through the area and go window shopping in the antique shops. Don’t forget to include a walk on the beach at sunset or sunrise if you’re both early birds. Either way it will be memorable. The most romantic beach is South Pointe Park. Perhaps you want to sit out on your balcony and look out at the ocean, any number of resorts and hotels offer oceanview rooms. What a wonderful way to start or end your day with coffee on the balcony overlooking the toppling ocean waves and azure skies. Enjoy your trip with your love. Pack your camera to take pictures of your fabulous vacation. Time is short and you will treasure those moments long after your trip. 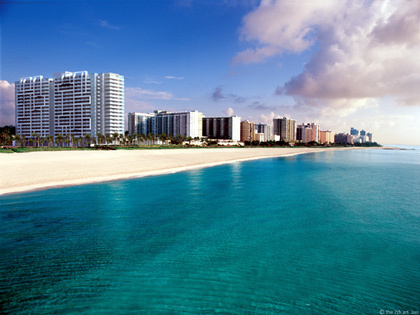 This article was written by Alissa Pittman from http://MiamiBeachAdvisor.com. To learn more about Miami Beach you can visit Miami Beach Advisor where you can get tips on planning a trip and read Miami Beach Hotel Reviews from Alissa Pittman and other authors. Get the best travel stories straight into your inbox! Information and media on this page and throughout Travel Blat is supplied by Wikipedia, Travel Blat users, and other sources. Freebase content is freely licensed under the CC-BY license and Wikipedia content is licensed under the GNU Free Documentation license. Travel Blat is independently owned.